You know what you do with “domestic enemies” of the United States? You hang them from a tree or put a bullet in their brain. 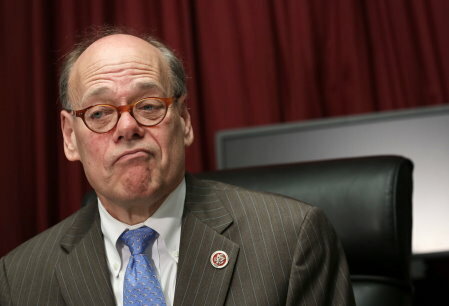 Apparently, that’s what Congressional Democrat Steve Cohen thinks should happen to conservative Republicans. But I know some of the members there, and a lot of those members, they’re rabid, they’re sophomoric, literally, they’re second term in Congress, never worked in politics before, and they think they are somehow like–it’s all talked in military terms. They think they’re some kind of guerillas there to strike a blow for freedom. I think they may try to pull this off again. What John Boehner is going to have to do is decide that he’s not going to be Speaker in 2015 and work with the same crew that gave us the opening-up of government: Nancy Pelosi’s Democratic caucus and give or take 80 reasonable Republicans and pass some bills to avoid another CR problem and shutdown and avoid the debt crisis, protect the country from these people, who really, you got to think, we take an oath to support the country against all enemies foreign and domestic, and these are the domestic enemies. It’s one thing for a loudmouth in a comment section or on a liberal blog to mouth off about “treason” or “domestic enemies,” but when people with real power start doing it, that’s dangerous for our republic because it suggests the possibility that violence may be used to settle political disputes. That’s dangerous and Republicans in Congress shouldn’t just let it pass.